It’s no coincidence that New Hope’s Ghost Tour attraction starts at the corner of Main and Ferry streets. 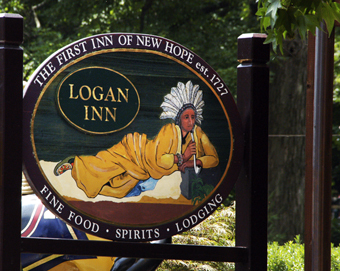 That’s the site of the Logan Inn, a much-storied haunted hotel that mixes old-school fireside spook stories with a line of more credible tales. Amid the claims that Aaron Burr stayed there after shooting Alexander Hamilton, and is still staying there, comes a more chilling tale from just after the second world war. In 1946, during an annual street fair in the Inn’s parking lot, a palm reader named Parker Dehn and his customers heard the loud and uncontrollable screaming and weeping of a child. Subsequent annual fairs avoided the spot. No child was found there or nearby, but the experience was so unsettling, Dehn closed up and went for a drink. That was on the opening Thursday night of the fair, and on Friday, the same thing happened. After the fair closed down, the sobbing stopped too. But the next year, the same thing happened in the same spot. By Saturday, crowds gathered around the tent to see if they could locate the source of the crying. But Dehn had had enough of the experience. 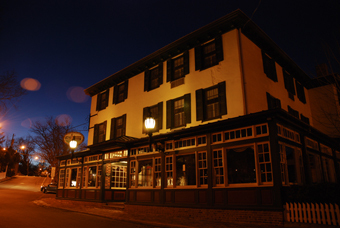 The Inn itself has plenty of stories associated with it—including windows that throw themselves open in the small hours, and apparitions of ghosts and small children. The most storied guest room is Room Six, which the innkeeper claims is haunted by a former proprietor who lost the inn because of debt. It was The Proprietor that initially held the most mystery for us. Regal in demeanor and stature she seemed every bit the lady. But every time we had seen her in the weeks leading up to our reservation a new piece of finery hid her neck from sight. It was no different on this night, a scarf wrapped around her throat in the middle of August. When we arrived she instantly knew us by name and calmly ushered us to our fated room. It was Jeff’s prerogative to keep our motives quiet, but I couldn’t help but tell her our plans and the fact that she was written about in a credited book on the paranormal. The mountain of gear gave us away anyway--we were either there to catch ghosts or do something worse. as described in several books. Beyond the new paint and TV (in an old oak cabinet) you could see the history of the place just hidden under the skin of amenity. But there was nothing odd or supernatural to be noticed. After we set up our gear we went down to the porch to have dinner. We had laughed at the sign that swung in the summer night. It read “Fine Food, Lodging, and Spirits.” So far we had two out of the three. Upon our return to room 6 The Proprietor was waiting with a smirk telling us that the portrait outside our room was an image of the owner’s grandparents from Bolivia, and that it wass the owner’s mother who is said to haunt our quarters. We were gone maybe an hour but now square in the center of the far wall of the room we discovered a wet hand print with elongated fingers that was definitely NOT there when we had left. Alarmed but skeptical, I began to orate our findings in my micro-recorder. As I was playing it back my heart leapt with wonder and horror. At precisely the moment Jeff’s hand touched the print on the wall an inhuman, raspy sigh seemed to float off the tape. With tears in my eyes I played it back to him causing him to almost burn a hole in the hardwood floor with his frantic pacing. We had come looking for evidence but we didn’t really want to find it. We ran several variable tests to see if any other ambient noises could have made the noise on our tape but even when pointed directly at the traffic it didn’t pick up anything remotely like what we’d heard. You can read about all of Pennsylvania’s other haunted hotspots in Weird Pennsylvania. The Stories on this site are just the tip of the iceberg. 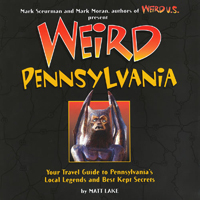 Buy Weird Pennsylvania today!